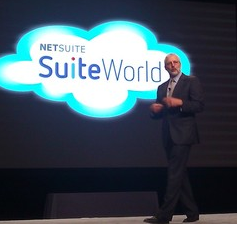 There was a great piece of theatre on stage at SuiteWorld in San Francisco this morning when NetSuite CEO Zach Nelson revealed that the company had signed an important new customer from the computing world: its archrival SAP. The software behemoth’s newly acquired subsidiary, SuccessFactors, remains a NetSuite customer, Nelson revealed: “They just renewed their license for NetSuite. I’m really pleased to welcome SAP as a customer.” [Disclosure: NetSuite has funded my travel and accommodation to be here]. Over in Orlando, SuccessFactors CEO Lars Dalgaard, recently confirmed as a member of SAP’s all-powerful Executive Board, has also been on stage today revealing SAP’s newly minted cloud strategy. Dalgaard was not going to stand there without being able to say he runs his business on SAP technology. According to a press statement issued today, SuccessFactors rolled out a slew of SAP applications internally within a six week period following the acquisition. That included transferring its financials onto SAP’s Business ByDesign cloud ERP platform. It may have renewed its NetSuite license, but SuccessFactors is no longer using its NetSuite instance. What I’m really interested in here, though, is the backstory. SAP nearly canned ByDesign recently, according to comments by co-CEO Bill McDermott. Was the platform reprieved when Dalgaard revealed the urgency of stripping NetSuite out of the Successfactors backoffice? Or was the NetSuite instance a bargaining chip that Dalgaard used to negotiate his new vision for for ByDesign, revealed on stage in Orlando today? That includes the creation of a new Financials OnDemand version that will be sold to SAP’s core large enterprise customer base. I can almost imagine Dalgaard banging his fist on the table, insisting on SAP offering a viable cloud app he can run his business on, saying that NetSuite will stay if he can’t get his way. Whatever his tactics, Dalgaard seems to have wrought a seachange in cloud strategy during his short tenure so far at SAP. Now that he’s running his business on the company’s own technology, he’s going to have a close view of how well it will work out in practice.